T-22 days… It’s crunch time… literally. I’m actually eating cashews and almonds as i write this. They’re delicious, unsalted and nutritious. Did you know that almonds are “a rich source of vitamin E, containing 26 mg per 100 g (Table). They are also rich in dietary fiber, B vitamins, essential minerals and monounsaturated fat (see nutrient table), one of the two “good” fats which potentially may lower LDL cholesterol. Typical of nuts and seeds, almonds also contain phytosterols, associated with cholesterol-lowering properties.” (Thanks, Wiki…) I love almonds. Everyone should eat more almonds. When i embarked upon this whole 1/2 marathon journey, I considered myself a wholesome, vegan eater who was in decent shape. Daily yoga did my body gooooood! Two months into training, my body feels incredible. I feel like a well-oiled machine. A well-oiled, somewhat sore machine, but well-oiled nonetheless. Running is hard! It’s not just the physical aspect, but the mental part is quite the challenge. Usually, my long runs are on Sundays. Last weekend, i was slated for a 9 mile run for the Sunday, but had plans all day. I decided to modify my schedule so i could do the run on Monday. I charted my course on Google Maps. The result i got blew me away. 9 miles is FAR. 9 miles is from my apartment all the way to Des Pins and St-Denis, and back again! Anyone who knows Montreal, knows this is not a distance to scoff at. Not one to back away from a challenge, i laced up my new runners (which by the way, are so awesome. ), charged up my ipod, and took off. 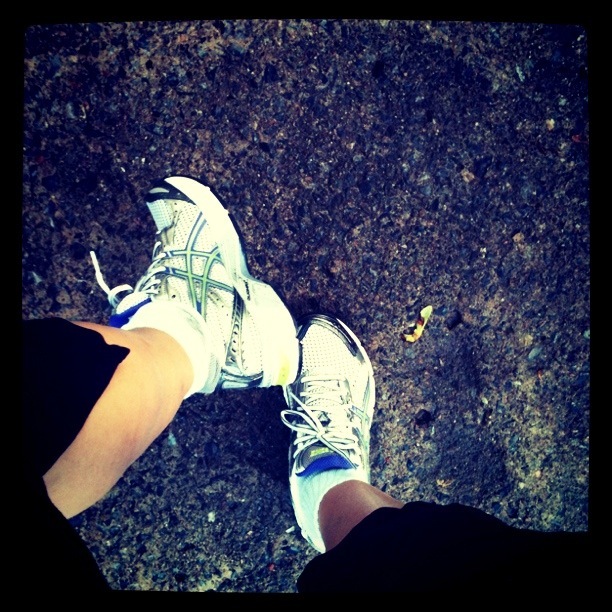 I WILL finish the race, thanks to my awesome Asics! During the course of this training run, current Sara HATED afternoon Sara for plotting this course. There were hills. Lots of hills. Hills going through Westmount, hills along McGill, hills everywhere. My calves were screaming, my bum was sore, my brain was sending curse words to my soul. It wasn’t solely a challenge on a physical plane. No, no, no. My brain was tormenting me, not with words of encouragement, but with bad words. At the beginning, i was intimidated. Then i remembered the yogic philosophy i repeat to my students time and time again in yoga classes: just breathe. Listen to your breath. Stay in the present and breathe. In. Out. Inhale, exhale. Just breathe. This mantra seems quite obvious, maybe a little foolish to some, but it’s what helped me continue. When i reached my halfway point, even though i was solo, i jumped and fist pumped the air. People stared, but their attention was quickly diverted to a man across the street throwing garbage on a wall. That man’s distraction allowed me a couple of seconds of victory dancing. (Thank you, dear Montreal and your eclectic people.) After that halfway mark, it was smooth sailing back home. Many experience runner’s block at the end of the race, during the last couple of miles. Having not run the full 1/2 marathon yet, I have no experience with the “wall” many hit. However, i am taking my yogic breathing with me, and hopefully will be able to overcome it by concentrating on the breath. Though 9 miles was extremely intimidating at the onset, completing it while running non-stop gave me a huge boost of confidence for the race on the 25th of September. Though training takes up much of my thoughts, my heart and soul hold dear the real reason i am running this race. This past week, i have been humbled and rendered speechless by the donations that have been pouring into my personal page. As a proud member of the PETA Pack, i am running this race to raise money for the Rescue and Investigations fund of PETA. My parents were the first to donate, and donate they did. My parents are 2 of the most compassionate people i know. Though my father teases me constantly about my vegan diet, i know they respect and admire my decision to live a more compassionate lifestyle. Many associate PETA with veganism, though they raise awareness on so many other subjects and investigations. By contributing to my PETA page, my parents have helped in a HUGE way to build dog houses for dogs chained outside by neglectful owners, to help retire and save animals beaten and neglected in zoos and circuses, to help finance spay and neuter services for low income neighborhoods, etc. Animals have no voice to ask or plead for help, yet they are neglected, beaten and used for our own gain every day. As many of you know, animal rights and the fight for their humane treatment is a cause so dear to me, so the donations many of you made have warmed my heart. I have even received an anonymous donation from someone who has never met me, sending me such kind words of encouragement. These gestures are what encourage me to run further during every training. Running 13 miles seems intimidating at first, but remembering that i am running for a cause much greater pushes me forwards. Thank you to everyone that has donated, your money will go a long way. If you have not yet donated, and would like to, please visit my personal page here! You still have time before the big day! September 25th is around the corner!